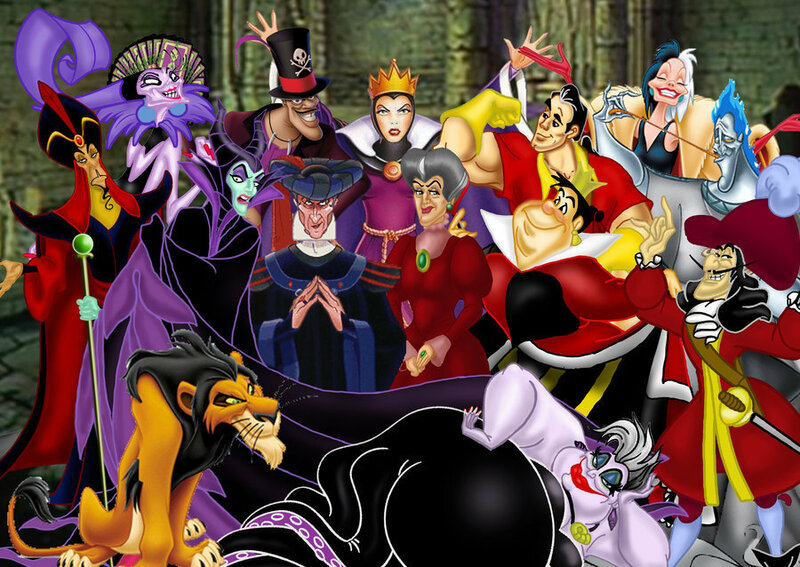 I think we can all agree, the best thing about the Disney animated musicals, are the villain songs. Not that there’s anything wrong with the hero’s songs, they can be quite catchy, but the villains are just sassier, more badass, more memorable, and sometimes so disturbing you can hardly believe that they’re in a kids movie (although let’s be honest, kids that young aren’t really going to get the undertones). So, in honour of those amazing songs, composers and lyricists, I present my ranking of my favourite Disney villain songs. There’s just something hilarious about a bunch of classic Disney villains booting Mickey and Minnie out of the House of Mouse. Kaa the snake isn’t the main villain of The Jungle Book (obviously Sheer-khan the tiger is), and as a bad guy, he isn’t very good at what he does…which is to try to eat people. But there is something incredibly insidious about his song, in which he tries to hypnotize an angry Mowgli. Also, Kaa is voiced by the Disney legend Stirling Holloway – voice of the Stalk in Dumbo, the Chesire Cat in Alice in Wonderland, and the beloved Winnie the Pooh (whenever I hear Kaa, all I can see is Pooh bear – imagine if Pooh had sung that while trying to woo honey from the bees). This isn’t sung by the villain of the movie (can you imagine Cruella singing? Ugh) but it’s no doubt catchy and jazzy. To this day, you need nothing else if you want to describe her character to someone. Listening to Roger pretty much improvise the music whilst Cruella storms into his and Anita’s house, smoking, rhapsodising about fur, underhandedly insulting Anita, and just generally looking like an evil witch, it becomes as if she is performing to her theme. Plus, Roger just sings it in such a cheeky manner. This is probably the most narcissistic entry on this list. What starts out as Lefou trying to cheer up Gaston and boost his ego after Belle’s rejection quickly turns into Gaston singing his own praises. It doesn’t take long for the egomaniac to emerge. No one sings like Gaston. He’s the guy we all love to hate. I love this movie’s music for the way it embraces that whole New Orleans feel. It’s occurring to me that a lot of our villains songs are sung as a way to trick or mislead our heroes, and Dr. Facilier is perhaps the most convincing, sneaky of them all. Prince Naveen has no idea anything is wrong until the songs final, terrifying conclusion. The Lion King 2 is one of the few Disney sequels I really enjoy, and I this is my favourite song from the film. Zira is just so bloodthirsty! Let’s be honest, what Simba did to the lionesses wasn’t the nicest thing, and Zira has let anger fester and boil until she lets it all out in this absolutely badass song. I always sing along, and it just feels so aggressive and GRRR! I feel like punching something. In a good way. Voiced by the absolute powerhouse Donna Murphy, this has a sickly sweet tone to it, and boy is it fun to sing to. Take a close look at this song, and you soon realise the true beauty of the evilness of Mother Gothel – she undermines Rapunzel emotionally and psychologically, and that is how she maintains her control. Snide remarks on her stolen daughter’s appearance and abilities are disguised as a mothers concern. Did you know that Jeremy Irons, the voice of Scar, didn’t sing the whole song? Jim Cummings took over towards the end because Irons’ voice gave out. I felt a little shattered. Anyway, this song captures everything about Scar and his lust for power. It oozes evil from the opening drums, and you’re lying if you tell me you don’t know all the words. My god, those lyrics! Dr. Facilier learnt everything he knows from Ursula. Again it perfectly suits Ursula’s tentacled self as she gets her grip on Ariel and slowly pulls her in. Ursula doesn’t even trick her – she tells her upfront what she wants, and the consequences if Ariel fails. Sure, she tries to mess with Ariel’s chances, but it’s actually a legit contract. Well, as legit as you can get from a Disney villain. The way Ursula starts slow, then builds pressure is so, so devious. And I think my favourite part – Ursula teaches Ariel in the song about the way women act, or rather, the way society expects them to act. It’s very tongue-in-cheek. Don’t underestimate the importance of body language! This film is far, far too underrated in my opinion, and Frollo is without a doubt the most evil villain Disney has produced. “Hellfire” is a counterpoint to Quasimodo’s “Heaven’s light”. This song tops the list because of how purely dark and disturbing it is. Frollo is the only character on this list who sings this song in solitude, without any audience, except of course, the eye of God who he imagines judging him (remember the part where he sings ‘It’s not my fault, I’m not to blame’ to the red hooded figures?) This isn’t really an enjoyable song in the traditional sense, and it shows just how twisted Frollo is. His type of evil is the one we are most likely to encounter in the real world. He lives by his own set of morals, and scarily believes what he thinks is right, despite the pain he brings to others. This song, about his burning desire for Esmerelda, is just creepy and more than a little rapey. Because it’s never the men’s fault if the women are to provocative, am I right folks? It definitely takes top place for being memorable, and evil. What did I miss? What would you have added? What’s your favourite from the list? May the tradition of the Disney Villain song never die – you better be prepared for some more badass lists in the future (bad pun very much intended. I’m not sorry). If you’re digging ReelGood, sign up to our mailing list for exclusive content, early reviews and chances to win big!